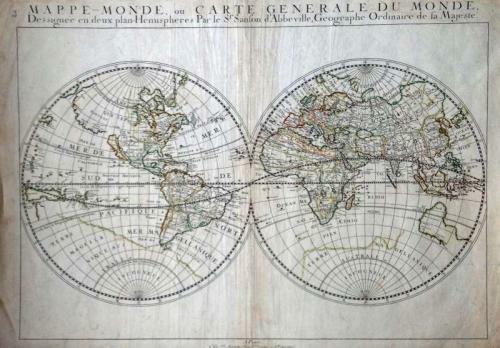 Title: 'Mappe-Monde, ou Carte Generale du Monde; Dessignee en deux plan - Hemispheres Par le Sr. Sanson d'Abbeville, Geographe Ordinaire de sa Majeste, Nicolas Sanson', 1651. An important double hemisphere world map showing California as an Island. It is one of the first maps to distinguish the Great Lakes and name Lac Superior and Lake Michigan, here called Lac des puans (lake of evil smells). All five of the Great Lakes were not named until Sanson's 1656 map of New France. The faint outline of Terra Magellanica appears in the south. Australia is only partially shown, and labeled simply Beach, with place names on the south and west coasts reflecting Dutch discoveries. Neither Tasmania or New Zealand is shown. The map is typical of Sanson's "scientific" style of cartography with no decorative elements. It was published in conjunction with Pierre Mariette (father and son), who published many of Sanson's works after 1645. The condition is good. Original outline color that is faded. The paper is toned and there are some minor margin repairs and creases. There is manuscript brown ink notation on the verso. Defects are reflected in the price.